We have a long association with the Pitlochry theatre as its original incarnation was housed in a tent here in the Knockendarroch garden. The Pitlochry Festival Theatre is now a few minutes drive away on the other side of the river and is regarded as one of the best theatres in Scotland. 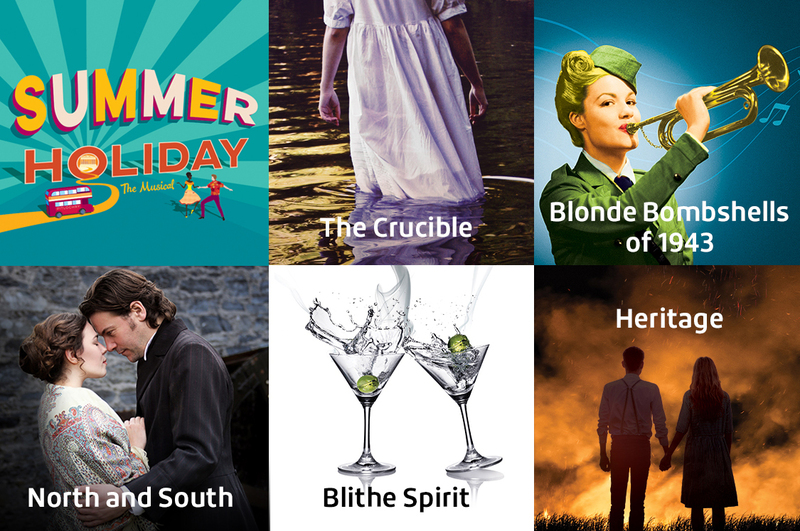 The 2019 Summer season looks like a cracker. Take a look at the line up below. Remember, we offer pre-theatre dining (our full 2AA rosette menu) at the Knockendarroch restaurant and complimentary theatre transport (during the main summer season). "During a wet Scottish summer, Pitlochry bus driver Don whisks his workmates away on a borrowed bus, in search of sunshine and fun in Athens! Along the way, the mechanics pick up a stowaway, rescue stranded singing trio Do-Re-Mi and fall in love! One of the most popular movies of the 60s, immortalised by Cliff Richard and The Shadows, make sure you jump on board and sing along!" Sure to be another PFT musical hit. "For the puritanical folk of Salem, Massachusetts, the news that their young women have been conjuring spirits in the forest is devastating. It means the devil is amongst them. And the devil must be hunted down and driven out, whatever the cost. Fear and suspicion quickly spiral out of control, unleashing a murderous powder keg of accusations, hysteria, lust and revenge. Arthur Miller’s 1953 play is one of the most powerful pieces of 20th century theatre. Written as an allegory for McCarthyism, when the US government persecuted its citizens for being communists, this parable of politics, religious fervour and fear is a masterpiece which still resonates in the 21st century." "Band leader Betty is in trouble. Her glamorous band has finally landed a big-time BBC performance on the wireless, but various illicit liaisons with the Yanks have depleted their ranks. In double quick time, remaining bandmates recruit new talent! Enter a draft dodging drummer who is unafraid to don a frock, a nun who plays a mean ukulele, an innocent schoolgirl clarinetist and a rather snooty soldier saxophonist. Will Betty and her assorted crew give the performance of their lives? Based on the BAFTA winning TV film starring Judi Dench, this show is guaranteed to raise your spirits with stunning, live vocal and musical performances of hits by Glenn Miller, The Andrews Sisters, George Formby, Fats Waller and more, with all the glitz and sparkle of a gone but not forgotten era." "Strong-willed Vicar’s daughter Margaret Hale has grown up in the rarefied atmosphere of rural southern England, so when her family relocates to the roughness and vitality of a Northern factory town, she is thrown into a new life of strikes and strife. Hot-blooded industrialist John Thornton rules his cotton mill with an iron hand. Sparks fly when Margaret challenges both master and millhand, only to discover that not all of her southern beliefs hold true. A tale for today, this timely adaptation of Elizabeth Gaskell’s great classic 19th-century novel by BAFTA-nominated writer Janys Chambers explores the complex relationship between North and South, and between women and men of different classes. Can reason overcome pride and prejudice? Can compassion triumph over a blind adherence to market forces? Can love bloom amongst the snowy fibres of a money-driven cotton mill?" This is Coward’s most successful, inventive and highly-spirited comedy. It was the longest-running hit of his career, the film version of which memorably starred Rex Harrison and Margaret Rutherford." "Canada 1914. Sarah McCrea stands on the threshold of womanhood, facing a bright future in a new country. Leaving Ulster behind, Sarah and her family carve out their existence in an emerging community. Drawn to one another through tales of a near-forgotten mythical Ireland, Sarah and her neighbour Michael Donoghue become firm friends. But when Sarah and Michael’s relationship deepens and his determination to define his identify catches fire, centuries of conflict threaten to blight their love. And for Sarah, the realisation dawns that old battles are being fought on new territory." Note: All quoted play descriptions above are from the Pitlochry Festival Theatre website. Many of our guests at Knockendarroch are theatre-bound and they are able to benefit from pre-theatre dining in our restaurant and complimentary theatre transport (summer season only). If we can help with theatre plans or book tickets on your behalf, please let us know. Please note: complimentary transport is only available those residents who book directly with the hotel on a dinner, bed and breakfast basis.